Every villain needs a safe house and the Islamic State (IS) is no exception. Luckily for IS, it has two, possibly three waiting for it, all of them courtesy of NATO and in particular the United States. The war in Syria has been going particularly poor for IS. With Russian air power cutting their supply lines with Turkey and the Syrian Arab Army closing in, it may soon be time for them to shop for a new home. If the war is going bad for IS, it is going even worse for the supporting powers that have armed and funded them. To understand where IS might go next, one must first fully understand those supporting powers behind them. The premeditated creation of IS and revelations of the identity of their supporters were divulged in a Department of Intelligence Agency (DIA) memo first published in 2012. The DIA memo is important to remember, as is the fact that before the Syrian conflict, there was the Libyan war in which NATO destroyed the ruling government of Muammar Qaddafi and left what one can only described as an intentional and very much premeditated power vacuum in its place. Within that vacuum it would be eventually revealed through the death of US Ambassador J. Christopher Stevens that from the Libyan city of Benghazi, weapons and militants were being shipped by the US State Department first to Turkey, then onward to invade northern Syria. And it appears the terrorists have been moving back and forth both ways through this US-sponsored terror pipeline. 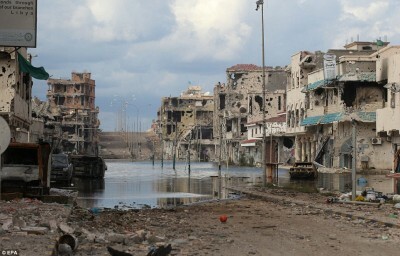 IS has since announced an official presence in Libya, and Libya now stands as one of several “safe houses” IS may use when finally pushed from Syria altogether by increasingly successful joint Syrian-Russian military operations. Iraq, devastated by a nearly decade-long US invasion and occupation, has teetered on the edge of fracture for years. Sectarian extremism is eagerly promoted by some of the US’ strongest regional allies, particularly Saudi Arabia. The US itself has been cultivating and encouraging the separatist proclivities of select Kurdish groups (while allowing Turkey to invade and torment others) in the north, while Wahhabi extremists seek to dominate the north and northwest of Iraq. IS itself has made its way into all of these trouble spots, coincidentally. And should the terrorist organization be flushed for good from Syria, it may find these spots yet another “safe house” that surely would not have existed had the US not intervened in Iraq, divided and weakened it and to this day worked to keep it divided and weak. Before Iraq there was Afghanistan..
Of course, and perhaps the most ironic of all of IS’ potential “safe houses,” there is Afghanistan. Part of the alleged reasoning the United States embarked on its war in Afghanistan, stretching from 2001 to present day, was its supposed desire to deny terrorists a safe haven there. Yet not only are terrorists still using the country as a safe haven, as pointed out in great detail by geopolitical analyst Martin Berger, the US intervention there has created a resurgence of the illegal illicit narcotics trade, and in particular a huge resurgence of opium cultivation, processing and exporting. This means huge financial resources for IS and its supporters to perpetuate its activities there, and help them project their activities well beyond. Berger’s analysis lays out precisely the sort of narco-terrorist wonderland the US intervention has created, one so perfect it seems done by design, a blazing point on a much larger arc of intentionally created instability. Libya, Iraq and Afghanistan would be ideal locations to move IS. Libya’s state of intentionally created lawlessness gives the US and its allies a fair degree of plausible deniability as to why they will be unable to “find” and “neutralize” IS. It will be far more difficult for Russia to organize military resources to effectively strike at IS there. Even in Iraq, Russia has significant hurdles to overcome before it could begin operating in Iraq to follow IS there, and only if the Iraqi government agreed. Afghanistan would be problematic as well. The ghosts of Russia’s war in Afghanistan still linger, and the US is already deeply entrenched, allegedly fighting a terrorist menace that seems only to grow stronger and better funded by the presence of American troops. But while IS will be safe from complete destruction in Syria, where it looks like finally Damascus and its allies have begun to prevail, relocating outside of Syria and its allies arc of influence in the Middle East will drastically reduce its ability to fulfill its original purpose for being, that is, the destruction of that very arc of influence. Furthermore, its reappearance elsewhere may change regional geopolitical dynamics in unpredictable ways. It is very unlikely IS’ new neighbors will wish to sit idly by while it broods. Libya’s neighbors in Egypt and Algeria, Afghanistan’s neighbors in Pakistan, China and Iran, and Iraq itself along with Syria and Lebanon, all may find themselves drawn closer together in purpose to eliminate IS in fear that it may eventually be turned on any one of them as it was on Syria. What is least likely is that those “supporting powers” realize this is a trick tried one time too many. While that is certainly true, it appears to be the only trick these powers have left. They will likely keep IS around for as long as possible, if for no other reason but to exhaust its enemies as they attempt to chase it to the ends of the earth.